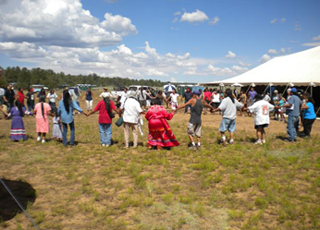 On July 25, 2009, hundreds of people amassed at the foot of Red Buttte, Arizona — just south of the Grand Canyon — for a three-day uranium mining protest hosted by the Havasupai tribe and supported by the Center, the Sierra Club, and Grand Canyon Trust. People from several tribes, states, Hawaii, and Europe — and even off-duty U.S. Forest Service staff — attended to protest. The event was one of the largest environmental protests ever held on the Colorado Plateau. The Grand Canyon region is under siege by the uranium industry. 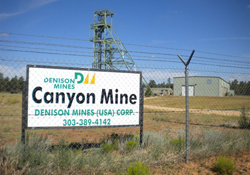 Despite a July 21 notice by the Department of the Interior, which placed 1 million Grand Canyon-area acres temporarily off limits to new uranium claims and exploration, there are several old mines slated for reopening that are unaffected by the action. Any uranium mining or exploration on lands surrounding the canyon could irretrievably contaminate aquifers that discharge into its biologically critical caves, seeps, and springs — including Havasu spring and falls near the village of Supai. Red Butte, the location of the gathering, is the sacred site of emergence for the Havasupai people, and it’s unfortunately just a few miles from the Canyon Mine — one of three uranium mines that Denison Mines Corporation seeks to reopen near the Grand Canyon. The Havasupai Tribe fought the Canyon Mine in court in the late ’80s and early ’90s. Despite a good fight, the tribe lost. Owing to a market crash soon thereafter, the mine was constructed but never excavated ore. New efforts to open the mine are being opposed by the Center, the Havasupai Tribe, and others. We’ve also taken steps to engage efforts to reopen the Arizona 1 and Pinenut mines, just north of Grand Canyon National Park. The demonstration consisted of traditional ceremonies and social dances, panels, speakers, relay runs to plant prayer sticks at the Canyon Mine, sweats, and reggae-band performances. The highlight of the event was a performance by the Havasupai tribe’s rarely seen Grand Canyon Guardians — dancing in full traditional regalia. The event was peaceful and there were no notable incidents (despite the unfriendly presence of a few staff of mining company VANE Minerals on the road leading to the protest). 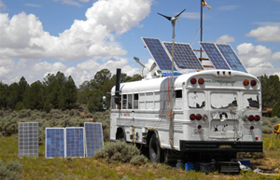 Staff from nonprofit communications group Earthcycles used solar and wind energy to power the public-address system and used a satellite uplink to broadcast the event. They also made recordings, which the Havasupai tribe plans to use as public comment opposing various upcoming uranium-development proposals. Protesters signed hundred of cards that were sent to Senator John McCain urging passage of the Grand Canyon Watersheds Protection Act, a bill introduced by Arizona Representative Raúl Grijalva that would permanently protect the Grand Canyon from uranium mining. Hundreds of cards were also signed and sent to Interior Secretary Ken Salazar, thanking him for Interior’s July 20 action temporarily protecting 1 million acres from new uranium mining. The Red Buttte gathering further galvanized a multicultural movement in the Southwest whose strength, growth, and resolve continues to match and resist the uranium industry’s best efforts to risk irreplaceable land, water, wildlife, and cultural values for corporate profits.